Between February 4 and March 17, 2012, someone stole from the Silverton Country Museum the gold Elgin pocket-watch that once belonged to Oregon Cartoonist Homer Davenport. It was removed from it’s locked case, along with a silver Hamilton watch that once belonged to William “Mack” McGinnis, former head of the Silverton Red Sox semi-pro baseball team. 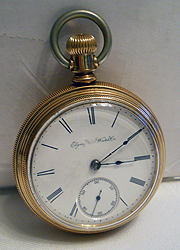 The watch is a gold Elgin with a white face and Roman numerals, and “Elgin Natl. Watch Co.” on the face. The back of the watch is engraved with an Arabian horse’s head in the center of a floral and ribbon design. Patent date is Feb. 19, 1884. The McGinnis watch has a white face with bold, black numbers. It’s engraved on the back with a deer head inside of a heart and floral border. The initials W.L.McG are engraved between the deer’s antlers. A brown shoelace with knotted ends is attached to the top. Mack’s watch was given to McGinnis in 1923. Descendents of his family donated the item to the Silverton Country Historical Society in 2010. 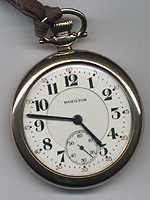 The Davenport watch was donated that same year by relatives of the political cartoonist, who died in 1912. The watch had been locked away in a safety deposit box for upward of 60 years before the Silverton Country Museum became its caretaker, said Hutton, who was dreading the phone call she would have to make to Davenport’s niece. If anyone has any details, please or information, please contact the Silverton Police Department at 503-873-5326. This entry was posted in General, History, Uncategorized. Bookmark the permalink.